With the modern business environment becoming increasingly dependent on technology, managementteaching in higher education faces the challenging task of effectively leveraging technology in diverse learning environments. This chapter discusses the use of virtualclassrooms, namely collaborative, information technology-mediated teaching endeavours in management education at universities. 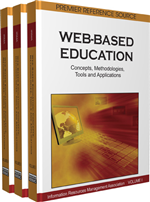 The overall aim of this chapter is to provide insights for those who are responsible for the development of management curricula and to give specific guidelines tomanagement educators interested in integrating IT-basedteaching to increase teaching effectiveness when designingvirtual classrooms.